Silver Goggles: Steampunk Hands Around the World 2015! Steampunk + Earthworm = ? Steampunk Hands Around the World 2015! Steampunk + Earthworm = ? Airship Ambassador Kevin Steil has been doing this event for a while, but this is the first year Silver Goggles will be participating! I have posed questions to my writers of The Sea Is Ours: Tales of Steampunk Southeast Asia, and will post their answers as they get to me! I, too, will post some thoughts reflecting on this year's theme: "Our Playground, Our Classroom, Our Workshop." It's an interesting theme, considering I have spent the last two years in classrooms of some sort of another. If you are here because of Hands Around The World, be warned that I deal very little in images. 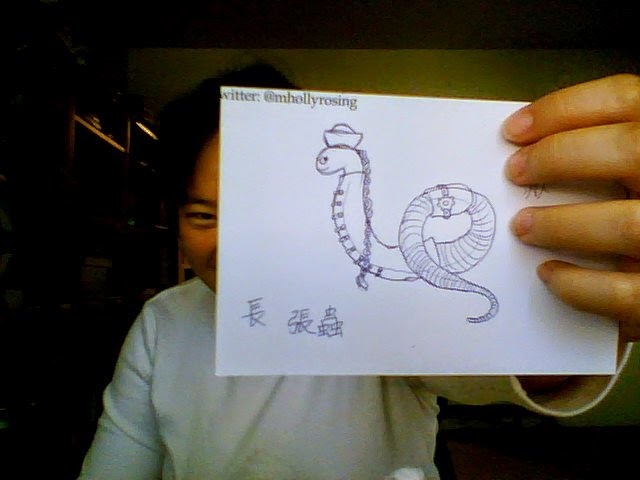 This is Chung Chong, a steampunk earthworm! My friend Rubato drew him for me when we were at the Clockwork Couture book-signing! (Which was, BTW, a lot of fun!) She was my ride there, and I remarked to her, since Ay-Leen has her steamborg panda, I ought to have a mascot too, but I just couldn't think of what! I'm not a big animal person these days, and the only creatures I've really been paying attention to are earthworms (which I now tend). "You could have a steampunk earthworm," she said. "But what would it wear? You can't just put a corset on an earthworm and call it steampunk!" I said, because I strongly disapprove of that notion. "It should be a Chinese earthworm though," I added. "And he could wear a chang (long robe)... a really chang chang (long long robe)!" And I immediately thought of Donnie Yen from the Ip Man movies, wearing a long robe and looking very graceful about it. We cackled over the idea for a few minutes, and then she declared, "I'm going to draw a steampunk earthworm for you now!" I don't like goggles, and wanted him to have a scholarly look, so she gave him spectacles instead. Of course, being a good subject of the Middle Kingdom, he has a queue! We struggled to think of a name for him, and settled on Chung Chong, which are different ways of saying "worm." I have had an on-and-off love affair with earthworms, before I even got into steampunk. To me, earthworms are the ultimate recyclers of the earth, transforming things that have finished their time into something new and glorious, that help other things grow. And no one really notices them, the humble things! I aspire to be like that someday--to transform things into something new and glorious, fresh soil to help other things grow. So over the next month I will share some of the things that have transformed in me because of my studies of and for steampunk. And do check out other people's posts for Steampunk Hands as well!